(APN) ATLANTA — On Monday, October 02, 2017, in a historic, unanimous vote, the City Council of Atlanta approved 17-O-1152, an ordinance to change City of Atlanta municipal provisions related to possession of one ounce or less of cannabis (or “marijuana”), to remove the possibility of jail time and lower the possible fine to seventy-five dollars. Currently, the City’s municipal code provides for a penalty of six months in jail and up to one thousand dollars in fines for possession of one ounce or less of cannabis. Many people thought this was a cruel and unjust penalty that is destroying lives and not helping anyone. Mayor Kasim Reed has indicated he will sign the bill, and still has four business days to take action as of today. Even if he vetoed the bill, which is unlikely, the veto would have enough votes to be overridden by Council. Like in the City of Clarkston, which decriminalized cannabis last year, Atlanta Police will still have the authority to arrest under state law or city law, although the expectation is that they will arrest under city law when the only offense is minor cannabis possession. The state law thus far remains unchanged, but there are pending bills to change state law as well. As previously reported by Atlanta Progressive News, the ordinance was introduced by Councilmember Kwanza Hall (District 2) and has undergone five committee meetings debates, two council meeting debates, and a work session over the past year. 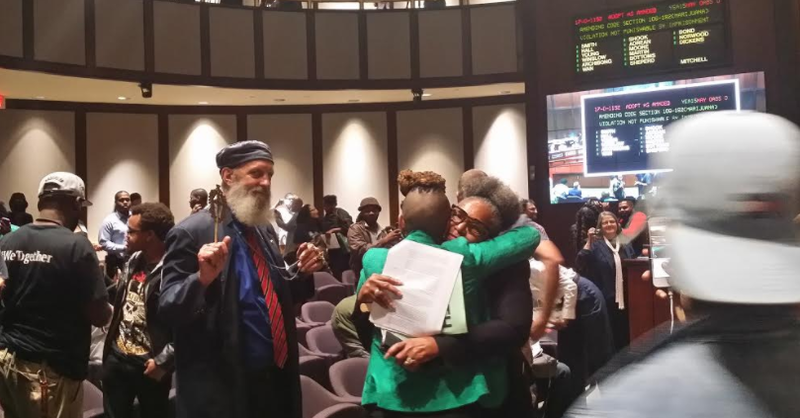 About 50 individuals, some representing various organizations, lobbied and spoke out for the passage of this long-overdue legislation, citing many reasons to do so, including the racial disparities in cannabis arrests in Atlanta. Data from the Atlanta Police Department (APD) show that 93 percent of arrests for cannabis possession in Atlanta are of Black people, even though various studies show that people of all races use cannabis at nearly the same rate. Black youth are disproportionately arrested under the marijuana laws, more than any other group of people. “The use or possession of marijuana is not the threat to our community. The threat is police officers who racially profile, target, arrest and even murder our people. It was APD who used the smell of marijuana to justify an unfair stop, which eventually lead to the murder of DeAundre Phillips,” Dean Steed, a community organizer with Solutions Not Punishment Coalition (SNaP Coalition), testified. SNaP and others have been working with Councilman Hall to revisit several so-called Quality of Life Ordinances; several were taken off the books earlier this year. “This is one of them days, the preacher call a day of reckoning… Which side are you on?” former State Senator Vincent Fort (D-Atlanta), who is running for Mayor and has been a consistent advocate for decriminalization along with Mr. Hall, said. Following Sen. Fort’s comments, Councilwoman Keisha Lance Bottoms (District 11) questioned Fort, in a testy exchange, a video of which has circulated on Facebook. “Sen. Fort, I have a question for you… Why didn’t you pass this at the state level, where it can actually make a difference?” Bottoms asked. “I’m so glad you asked that question. Because if you took the time to send your staff to the computer, you will see I am an author of a bill to defelonize marijuana at the State Capitol. So don’t try to score political points with me, because scoring political points ain’t helping those children over at the City jail!” Fort replied. “I didn’t ask you what you introduced, I said why didn’t you pass it… Did you pass it?” Bottoms said. “Don’t try to score political points. You’ll be able to score political points when that vote comes up on the board,” Fort said. Council President Ceasar Mitchell–who is also running for Mayor–got into an argument with Bottoms, who continued to try to ask questions of Fort, even though Mitchell said doing so was out of order during public comment time. Finally, Mitchell got Bottoms under control and public testimony continued. Bottoms then indicated to Deborah Scott, Executive Director of Georgia Stand Up, that she wanted to meet her in the hallway. According to two individuals familiar with the matter, Bottoms could be heard by Councilmembers from the Council Chambers shouting at Deborah Scott in the hallway. The Mayor’s Chief of Staff, Katrina Taylor-Parks, attempted to break up the argument, but Bottoms continued to re-engage Scott in the verbal altercation. Scott declined to provide details to APN, but said she was pleased that she was able to convince Bottoms to change her vote. A few commenters, including a student and a veteran, were brave and selfless enough to testify about their use of cannabis for medical reasons and how it is the only thing that helps them. They testified about having to break the law in order to self-medicate. “There’s a lot of discussion about state law versus municipal ordinance and I want to say I think that it is a red herring. If you won’t vote yes because the Mayor told you not to – just say so,” attorney Tiffany Williams Roberts said. “We have heard the City of Atlanta police chief say that if given that instruction by the executive, she will deprioritize marijuana arrests,” Roberts said. State Rep. “Able” Mable Thomas reminded the room that the State has, so far, passed several bills to move medical cannabis along and allow for several different conditions to be treated with CBD oil. “We can never be in a situation where the State [of Georgia] is more progressive than the City of Atlanta,” Thomas said to roars of laughter from the audience. Going into Full Council, APN counted eleven likely yea votes, and four likely nays, based on comments that Councilmembers had made in previous meetings as well as in APN Candidate Questionnaires. It was believed that Bottoms; Cleta Winslow (District 4), Joyce Sheperd (District 12), and Michael Julian Bond (Post 1-at-large) would each vote no. However, they appear to have been persuaded by the activists’ presentations. 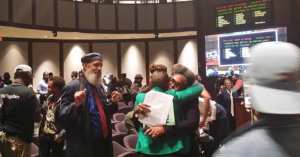 When it came time to vote, Bottoms offered two amendments, one of which was incorporated into the ordinance, to mandate APD training that will address the difference between the City of Atlanta ordinance and State law with respect to cannabis, possession, arrest, detention and prosecution. “Today we stand with every parent of Atlanta who is fearful of or has seen their children’s lives destroyed, or careers ruined because of a racist policy that unjustly incarcerated minorities by more than ninety percent,” Hall said in a press release. Congratulations, Atlanta. – It’s wise to the join the various states and localities that are ending the monstrously destructive, fraudulently-enacted marijuana prohibition. Science and widespread experience have shown marijuana is not addictive and is far less harmful than alcohol. – Yet, more than 600,000 innocent Americans are arrested for simple marijuana possession each year and made second-class citizens – for life! They will forever face large obstacles to decent employment, education, travel, housing, government benefits, and will always go into court with one strike against them. They can even have their children taken away!